I always like pictures that are made out of geometric shapes. 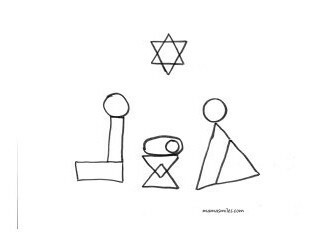 I love the simplicity as well as the flexibility, and it’s a fun way to talk with young children about different shapes and the way they fit together. 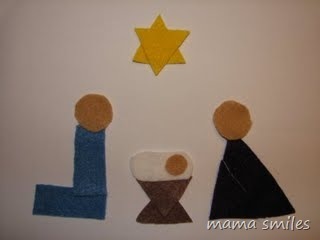 This nativity scene was made using five triangles, three circles, two rectangles, one trapezoid, and one oval. We made this out of felt because I plan to keep the pieces and use them to build different scenes over time, but you could make it out of construction paper and glue it together that way (or glue down felt pieces) just as easily. My two-year-old is barely beginning to understand the Christmas Story, and she likes learning about it in different ways. This sketch shows how more clearly how the pieces go together. I actually cut it apart and used it as a pattern to create the pieces for the finished product, although if you look closely you’ll notice I flipped the pieces for Mary’s dress around. The sketch can be downloaded as a PDF for use as a pattern here. Cool! Can the pieces be broken apart for further play? Great idea! 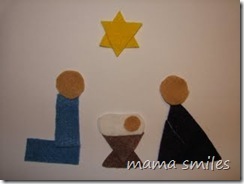 The pieces can be broken apart for further play – that’s the beauty of using felt pieces on a flannel board!